In my marketing system that I’ve been using for years that just leads to success, happens to be the same type of system that most other successful online marketers, and in fact offline marketers use as well. Stumbled on it by accident. It’s only after years and years of people asking me of me doing it and then people asking me for help, that I suddenly realized I had a system that I’d I developed over a, you know nearly 30 years at the time. That just works. So and it starts of just a recap. It starts off with having a presence on its. So that your website. Then having a profile which is your social media profiles. And then having, picking out only potential clients. Customer profiling, avatars, etc. Number 4, is asking them permission to market to them via some kind of opt in or lead magnet, or something. Then number 5, is we then nurture them and convert them into a purchase. And number 6, once they have made a purchase then we work and we do our utmost, absolute best to then convert them to become a preacher. Notice all the Ps. Yeah. And once that happens, once they become a preacher. Then number 7 happens the system perpetuates and it becomes a perpetual sales cycle because your customers that come through it, then find new customers and put them back in and they go. And they come out, they find new customers. They put them back in and it perpetuates a perpetual sales cycle. And that is how it works. But the last part is referrals. Now of course everyone and one will ask what’s the most important part Jon and of course each time I say something different, because when it comes down to it, they are all very important. But this is the one where most of us let it slide. Okay. So once someone has made a purchase, it doesn’t matter how little this could be 5 pounds or $7 or a 10, a 20. It could be anything. Once they’ve made a purchase, we want to do everything in our power to have them make a repeat purchase. A second to buy again. Then they have, they are a repeat buyer. And then we want to do everything to have them buy again. Now at this point, they are starting to become a regular buyer. But this is not a fluke. And there’s 2 reasons for this. First of all, in your mind, you’ll be trying to convince yourself that they bought that was a fluke. You’re scared to ask them what they thought. In case they say well actually when it arrived, it was awful, it was horrible, it wasn’t what I was expecting. But when they have done it again. And then they have done it again. You can realize that they are actually buying because they want to buy. And that means you are doing something great. For first of all, you are fulfilling their expectations. And secondly you are fixing their problem. You are scratching their itch. Cool eh? But they like you. Now this has, this has a thing for confidence in your mind. This means that they like it. And that means there will be other people that like it and who better to ask then the person who uses it. And knows how wonderful it is. So this is why we ask for referrals. And this is why it’s important to get them to that sort of second or third purchase. Or that 2nd or 3rd month of a recurring payment when they are a client. And when, so that you can ask them for referrals. But that’s not, I mean that’s the easy way. There are many opportunities for getting hidden opportunities. So let me give you a couple of examples. Now on Tuesday, I talked, if you want to go back and listen to, because you naughty, you naughty person. Have you not listened to Tuesday’s episode? It was the 5 things that you need in your emails signature. And one of them was, an offer like a message or, it’s more than a P.S, I mean you put your P.S. this is in your fix email signature, that I hope you are using wisestamp.com for. You can put your message in there with a link to your opt in because when, what generally happens in that perpetual sales cycle, when somebody is referred. The point where they come back in to that sales cycle is in at the permission, asking for permission to market to them. And then they purchase, and then they become a preacher. Then they send their friends in who ask for permission to market to you know. And that’s where it comes in. so they come in at the opt in. So on that email signature, when you send out an email, every single email to every single person you ever email, even to friends, and family in your fixed signature. Just add a link to your offer, to whatever it is, so for instance we have the ultimate. If you go to www.MarketingForOwners.com/71, you can see how this works. I mean you know how these things work. You can sign out, you can get the download, and then you can opt out. You know you can unsubscribe. There’s a one click unsubscribe. We don’t hustle you, we don’t phone you up. Don’t ask you for a phone number or a credit card, or anything like that. Nothing for sale. So but that book that has the 71 tools that me and my staff, and my team use every single day to run our business and to advance us in marketing. Virtual free stuff by the way. So we have that in signature, or an offer to join the Owners Club. No matter what it is. In fact in my Fire Safety business, there is an offer to join the Owners Club. Different business in signature. Because quite often my clients there are small business owners. Yeah. So that’s an opportunity. But referrals. So you can ask people for, I mean that’s a marketing opportunity. You can ask people in that signature. Do you know someone else who would benefit? Would you like to share this? You can share the email. You can share the offer whatever you are talking to them about, if you put that in your signature, you can ask for a referral. And send them to a dedicated form, a dedicated place, a dedicated page. So that when they come to that landing page, there’s hi thanks. You’re here because someone just referred you. We’d love that. And we’d love to approve. You can either fill in this form or email us here. Or call on. And that’s it. So that’s another opportunity. It doesn’t have to be an opt it. It can be for a referral for someone to refer. Someone outs onto you, okay. Now when you contact them, when you speak to them, when you offer, when you sell to them. How about giving them something, a leaflet. A little something. A card. Where they can, it can make it easy for them to pass it on to someone else. So your delivery drives can give out a couple. Don’t give them loads of these. So these cards would refer a friend, and they are probably going to give your friend or colleague, something, something that’s easy, something something that makes their life simple. Don’t worry about it. Just carry on. And just give it to them. Just give them whatever you want. And it’s fine, just give them an e book, a download or something. But say pass to a friend, just give them a couple. Every package you send out, put a couple in the package. Every touch point. Give a couple. Change the design every now and again. Change the offer. Change whatever you do. Just keep on changing. Make it different. Keep them interested. Give them reasons. Every touch point whether that’s by email or by, on the phone. How about asking them, have you heard of the net promoters ? Out of from 1 to 10, with 1 being the highest. How likely are you to refer us to a friend? Now if people answer 6 or 7, you can ask them what would it take to make us an 8 or 9? If they answer 10, contact them and say thank you very much. And would you have anyone in mind? You can put that out in a survey. And you can then get people’s feedback. There are ways, every, you can put that in your email signature. You can just send out the thing. 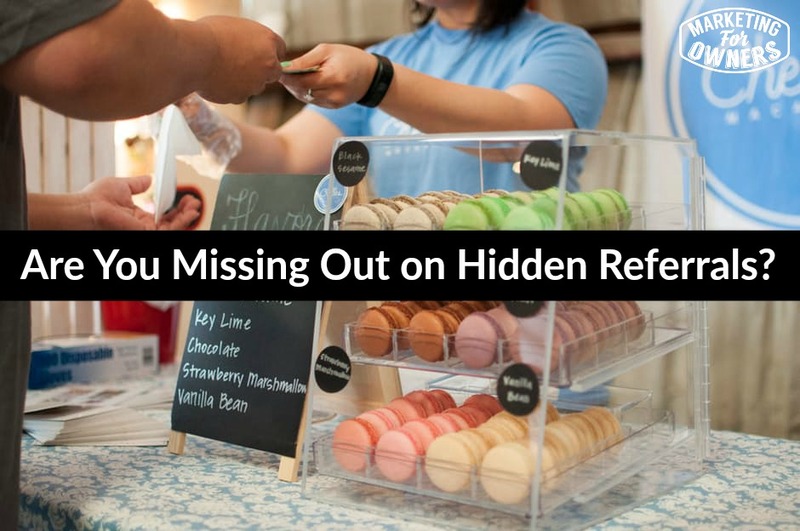 You can send a letter, there are so many ways to generate referrals. Now I want you to think of every single time and touch point so you can do this. Because if you’re not, you’re missing out on free business. These are your advocates, your evangelists, your preachers, the people who use your stuff and they love it. And that’s why they are using you. You can have more of them. Okay? Finally, podcast, Drive Time Podcast. 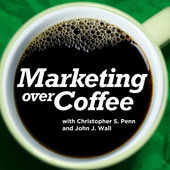 Today is Marketing over Coffee. And it’s by Christopher Penn and by Jon Wall. And it’s been going for years. And it’s incredibly popular. Most marketing people would count that on their list of top 10. I’ve, not going to tell you anything more about it. I’m just going to say, go and listen to it. Simple as that. Anyway have a good day. Don’t forget the interview tomorrow. See you soon.